I love exploring the city. But sometimes I limit myself to my surrounding neighborhood. There’s always new things to check out and it is too convenient. However, it is always nice to see what else the city has to offer. Just this past weekend, I was in Chinatown. I love Chinatown. The food is delicious, so much culture, and tons of shops filled with cute little trinkets. Unfortunately, I don’t make it out there that much. With the beautiful weather, it just seemed too perfect not too. We dined at the infamous Joy Yee (my parents’ favorite). I really like how the items on their menu have pictures! So much food, but oh so good! Another favorite place of mine is Saint’s Alp Teahouse. The food is mouth-watering, affordable, and the milk tea selections are amazing! If you happen to visit Chicago, I highly recommend going to Saint’s Alp Teahouse. Even just for their teas. It is one of the best hidden gems! Looks like a fun trip, I live in the city but haven't made it out to Chinatown yet, but it's on my list! I love that J Crew sweater! Definitely should go check it out! Those shoes are so cute!! Love this look! It's so fun to explore different neighborhoods around the city. Unfortunately, we don't have a Chinatown, but we do have a Little Havana! Lol… Love your coat! Haha I'm not surprised you guys have a Little Havana! I bet it is awesome! Thanks Ivete! Seriously so fun going around and exploring other towns! Love this look so much on you! That coat is fantastic! Such a cute outfit and love that sweater! Such a cozy, stylish outfit! I'm seriously loving this!! 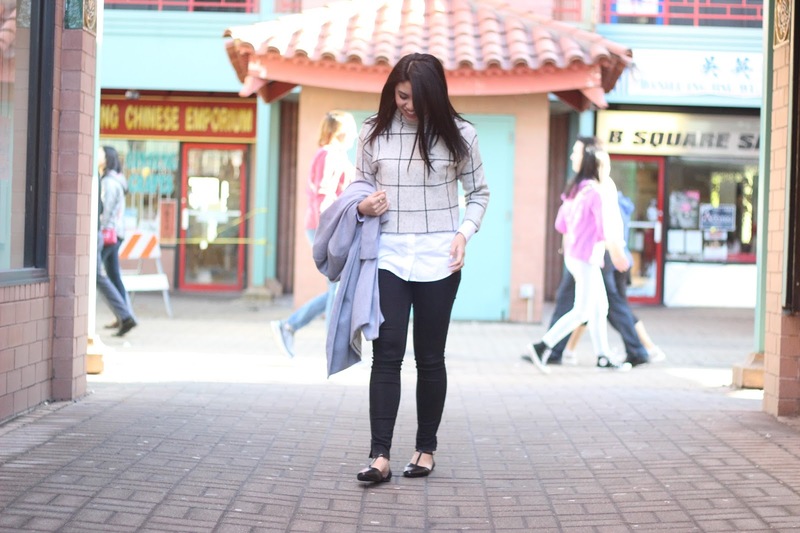 Windowpane is such a great print. How fun! I LOVE Chinatown – haven't been in ages though! You look stunning, always! Love those flats!! Thank you Vanessa! We should go together some time! NYC's Chinatown is pretty cool too!! So sorry it is sold out, but hopefully you like the coat! I love the food in Chinatown! Sounds like such a fun time. Beautiful outfit! Love the layering. Thanks Lili! The food is always amazing! How fun! I bet Chicago has so many great places to explore. Love how you layered your tops. I have been to Chinatown in Chicago a couple times and just love it! You look absolutely adorable, such a super fun outfit! Thanks so much Andrea! Glad to hear you had a great time! I love Chicago! I definitely want to check out Chinatown next time I'm there! Also your outfit is so cute…I love how you styled the turtleneck sweater! So glad to hear you love Chicago! Definitely worth checking out! Thanks Valerie! Love the outfit babe, the grey coat is gorgeous! Gotta love Chinatown, the colors, people, energy, everything! Such a great look! 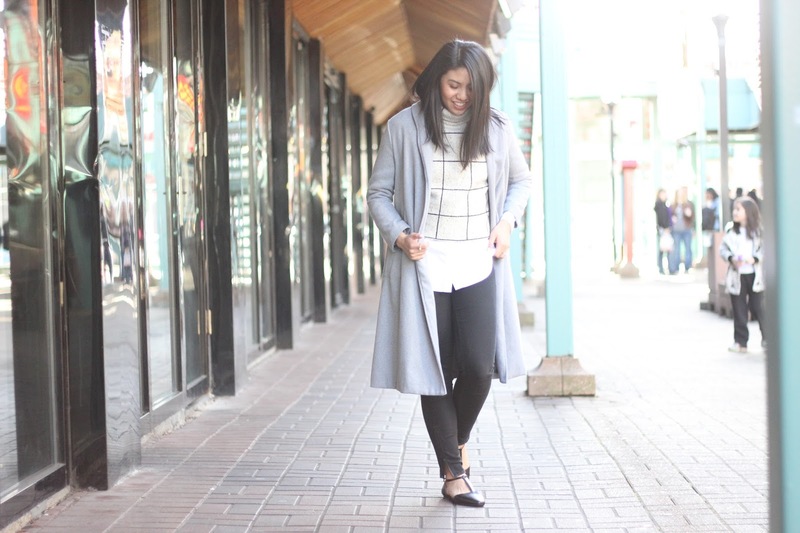 Love your top combined with that coat color! The undershirt, the sweater, and the coat off the shoulders — it's like you're giving a master class in layering! i love this outfit rach! Such a fun outing and I love your sweater! What a fun outing! You look lovely… I adore that sweater! 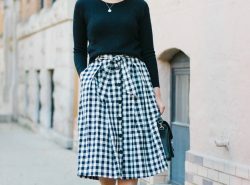 SheIn for the win with this look – I love it! Since I've only been to Chicago once (and I was in high school), I don't remember visiting China Town, but if it's anything like what we've got here in Toronto….there's so many great sights…and FOOD! Glad you guys had fun! Omg, you need come back and visit! Toronto's Chinatown is amazing! I'm in love with all of your layers, especially your top! You look amazing and what a fun place to explore!! I love Chinatown, hehe. I make an effort to visit Chinatown in any major city that I visit (but I haven't been to Chicago). Love your casual outfit, perfect for a day of exploring. Lovibg neutrals on you especialky that sweater! I like that sweater. It reminds me of my fiancee's style. She likes neutral colors like beige, white, gray, gold, and black. That sweater would be right up her alley because it is light with dark patterns. I think I'm going to check out that website and maybe get her something like that. Be a good fiance, eh? Thanks Ricky! I think it is a good investment. Just be sure of the long shipping time!! Love that sweater! What about to follow each other on gfc? I love this top Rach! Your outfits are seriously the BEST! Have an amazing day! Thanks Danielle!! Hope you have an amazing day too! Such a cute sweater on you! I love grid print. Love your look girlfriend! I used to live really close to China town and hardly went explored that area, I really feel like I should spend an afternoon down there! Thanks Sarah! Omg totally should explore when it is nice out again! Exploring the city is always a good thing because you never know what new cafe, restaurant, shopping mall or building that you might discover. 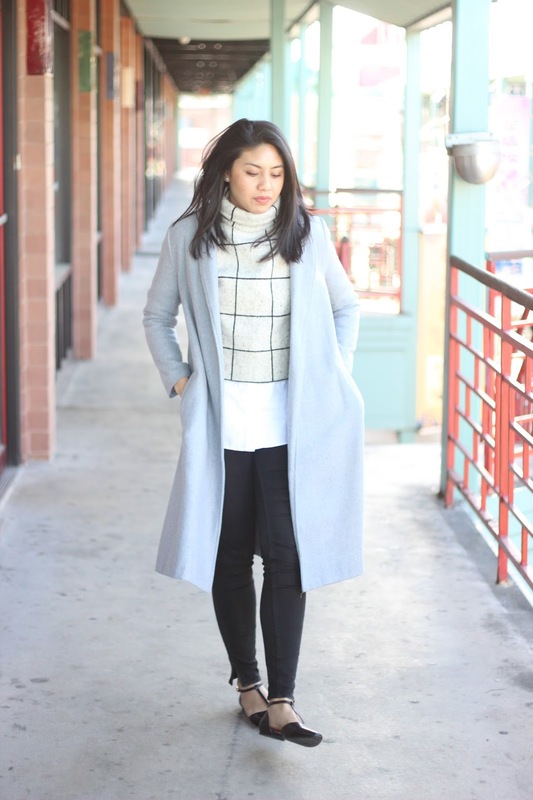 Your coat and sweater from SheIn look amazing, you styled everything to perfection. It is so true!! Thanks Meron! Looks like a really fun trip! I have been to Chicago and LOVE it, but have never been to Chinatown! I'll have to check it out the next time i'm there! Definitely worth exploring! Thanks Jaclyn! 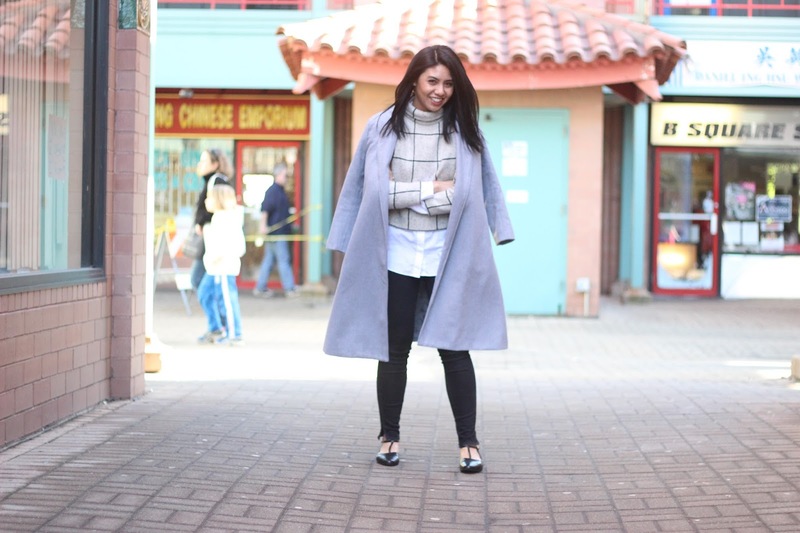 Awesome street stylin there Rach – love the powder blue oversized coat! Have a fab week ahead! 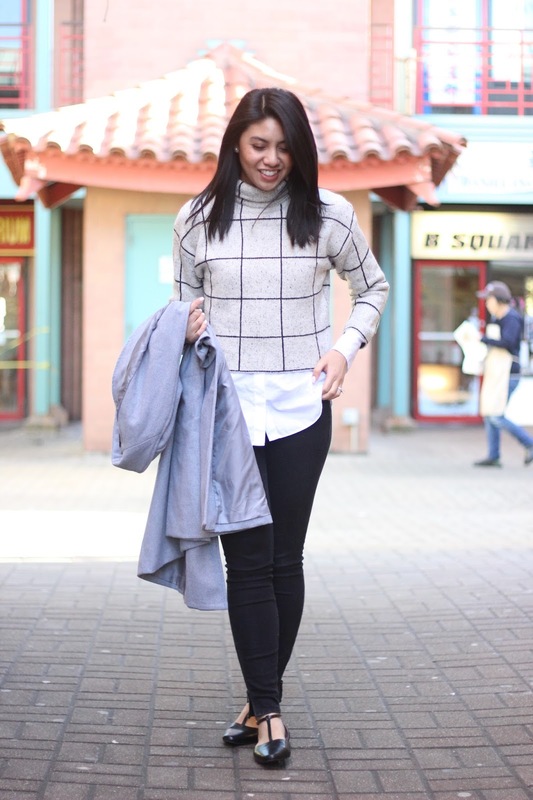 That grid-print turtleneck sweater is so cute! And the pastel coat is a gorgeous pop of spring color! I'm a big fan of the windowpane pattern so naturally I would be in love with this knit. I like that it's casual or with a change of style, it could be dressy. It's the perfect length on you as well. This is an overall adorable look. Love this coat most, amazing style! It would be so fun to visit Chicago's Chinatown… I'm originally from SF (now living in/near LA) so Chinatown has a very special place in my heart.